When a CT scan revealed the source of his Beagle’s stinky, six-month-long sneezing spree, Mark Kovicak was flooded with emotions. There it was in black and white: Poor Rex had had a stick up his snout the entire time. He was thrilled to know that his dog’s painful condition could be quickly fixed, but his mind retraced the weeks and months of nosebleeds, vet visits, antibiotics, and loads of laundry, wishing Rex hadn’t had to suffer through it all. “He was tough to not let in the bed, because he had such a hard time through this process, but I’d have to wash every piece of clothing he was exposed to because it was a bloody, super foul sort of drainage,” says Mark. The Beagle lover had hoped to improve Rex’s quality of life when he adopted him from Michele’s Rescue last November. “He was a stray found somewhere up in Mid Michigan on the road, and he had mange and a tapeworm — he was kind of a mess,” Mark recalls. 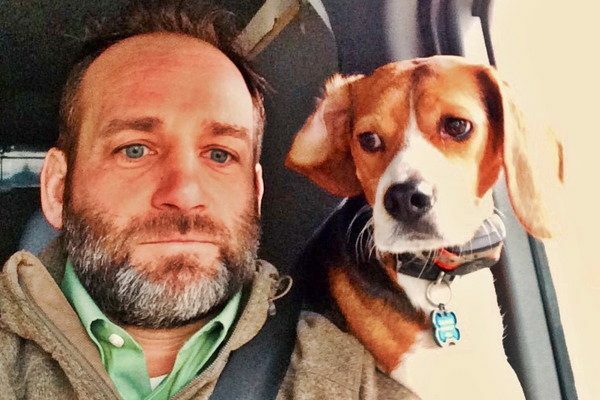 After the folks at Michele’s got Rex fixed up, Mark adopted the 1-year-old dog, hoping to fill the Beagle-shaped hole left in his life by a beloved canine family member who’d recently passed. For the first few months Rex was healthy, and basically a typical Beagle. It all changed one day when Rex chased down a rabbit just outside the local dog park and came back with a bloody snout. Mark assumed Rex had been swiped by a possum or a skunk, or possibly run into a fence or some thorns. As the pair continued into the dog park, Mark realized whatever happened was pretty serious. “He was sort of spinning around, sort of digging a little nest for himself under a bench — acting very strange,” he remembers. The next day Mark had Rex at his vet. The staff were concerned and able to fit the young dog in right away, but the stick that was causing Rex to sneeze and bleed was very well hidden. Rex was released that same day, but Mark says the anesthetic was tough on him and the next few weeks were touch and go. Soon Rex was back at the vet and was once again sedated while his doctor acquired a culture of bacteria in his nose. He was started on a broad spectrum antibiotic, but Rex was beginning to change. He started to shrink away from petting, and playing with other dogs became a dangerous game. “If his nose got bumped, his day was done,” Mark remembers. After a month on the antibiotics, Rex’s vet referred Mark to BluePearl Veterinary Partners and Dr. Kristopher Sharpe, who would finally solve this medical mystery. 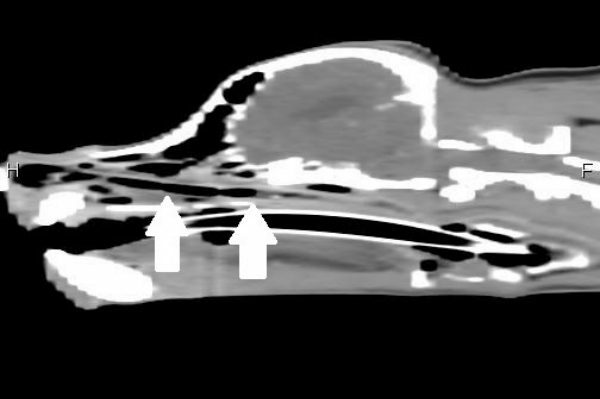 After further medication, Dr. Sharpe suggested a CT scan, as the imaging technique picks up organic matter (like a stick) better than an X-ray. Mark decided to book a scan, and is so happy he did. “The CT just couldn’t have been more revealing for a definitive, immediate outcome,” he explains. After the stick was revealed, Rex was anesthetized and Dr. Sharpe got it out. According to Mark, Rex recovered very quickly once the stick was gone. Rex’s CT scan success story has attracted media attention, with the dog appearing on TV’s Inside Edition. Mark hopes the tale of the hidden stick will encourage the use of CT scans on veterinary patients. 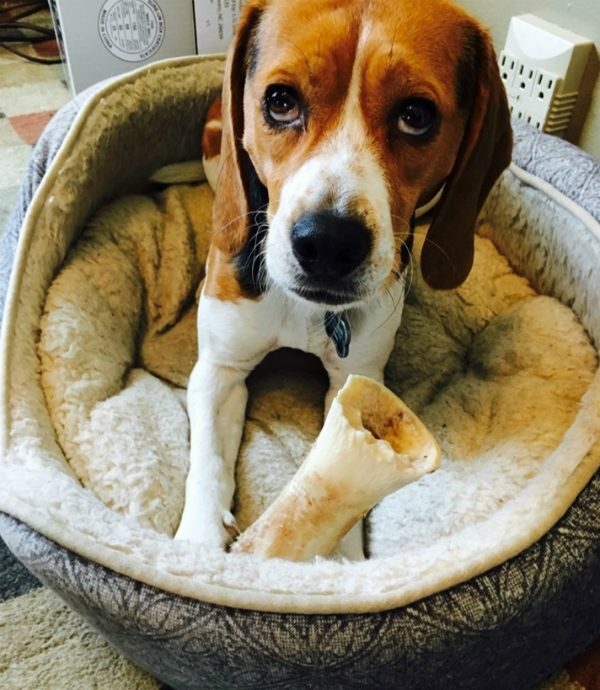 The post Rex the Beagle Survives Having a Stick Up His Nose for Six Months appeared first on Dogster.